49M with a history of hypertension who presented to his primary physician for routine follow-up and was referred to the ED for an abnormal ECG. He denied chest pain, shortness of breath, or any limitation to baseline exercise tolerance. His vital signs were notable for systolic hypertension and his examination was unremarkable. A chest x-ray showed no acute cardiopulmonary findings. 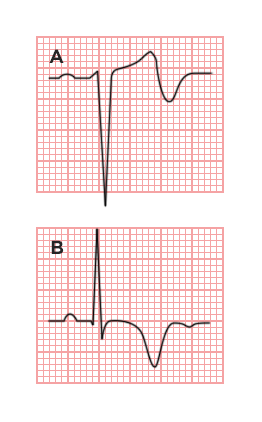 His initial ECG demonstrated a biphasic T-wave in V2 and deep, symmetric T-wave inversions in V3-V6. His initial serum troponin was markedly elevated at 3.499. He was admitted and urgent coronary angiography revealed proximal LAD stenosis (70%), mid-LAD stenosis (85%) and 1st right posterolateral stenosis (85%) which were stented. He was discharged on post-procedure day one and has remained asymptomatic at outpatient follow-up. Initially described in 1982 where a subset of patients who did poorly with medical management of “impending myocardial infarction” (essentialy unstable angina) were found to have characteristic ECG changes. These patients were noted to be at increased risk for extensive anterior wall myocardial infarctions due to proximal LAD stenosis. Wellens Syndrome (or LAD coronary T-wave syndrome) represents a “pre-infarction” stage of coronary artery disease manifested by critical LAD stenosis. The natural history includes progression to extensive anterior wall myocardial infarction, often associated with severe left ventricular systolic dysfunction, cardiogenic shock and death. These changes may be mistaken for “non-specific” T-wave changes (which in the presence of a non-concerning history and typically non-elevated cardiac markers) may lead providers to inappropriate dispositions such a stress testing which is contraindicated. Recognition of this pattern and its appropriate management (urgent coronary angiography) is critical. The case presented above is atypical. The patient had no history of chest pain and cardiac enzymes were significantly elevated – two features which are uncommon in Wellens Syndrome. However, the patient’s elevated cardiac biomarkers led to admission and angiography with identification of the characteristic proximal LAD stenosis (and other disease). de Zwaan C, Bär FW, Wellens HJ. Characteristic electrocardiographic pattern indicating a critical stenosis high in left anterior descending coronary artery in patients admitted because of impending myocardial infarction. Am Heart J. 1982;103(4 Pt 2):730-736. Tandy TK, Bottomy DP, Lewis JG. Wellens’ syndrome. YMEM. 1999;33(3):347-351. Rhinehardt J, Brady WJ, Perron AD, Mattu A. Electrocardiographic manifestations of Wellens’ syndrome. American Journal of Emergency Medicine. 2002;20(7):638-643. doi:10.1053/ajem.2002.34800. Mead N, O Keefe K. Wellen′s Syndrome: An Ominous EKG pattern. J Emerg Trauma Shock. 2009;2(3):206– doi:10.4103/0974-2700.55347. Kannan L, Figueredo VM. Images in clinical medicine. Wellens’ syndrome. N Engl J Med. 2015;372(1):66. doi:10.1056/NEJMicm1400946.